This thickly potted jar was probably made for storing wine or food. 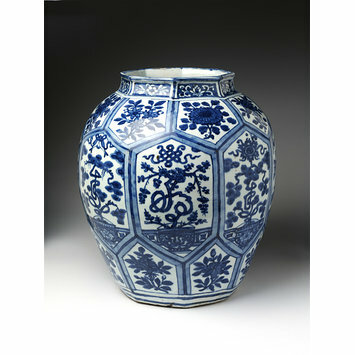 It is made of white porcelain and is painted with underglaze cobalt blue. The design is arranged in panels enclosing flowers on the shoulders and on the sides are larger panels depicting growing trees and plants in flowerpots, their stems drawn in the form of the Chinese characters 'fu' and 'shou'.It was made in the second half of the 16th century, clearly to be enjoyed by the local market who were able to read the Chinese characters. However, the jar was acquired in the later 19th century in Iran, presumably having been exported when new, similar jars were in the Ardebil shrine, dated 1611. Jars of this size were very difficult to produce, often collapsing during firing: perfect examples like this one were therefore highly valued. 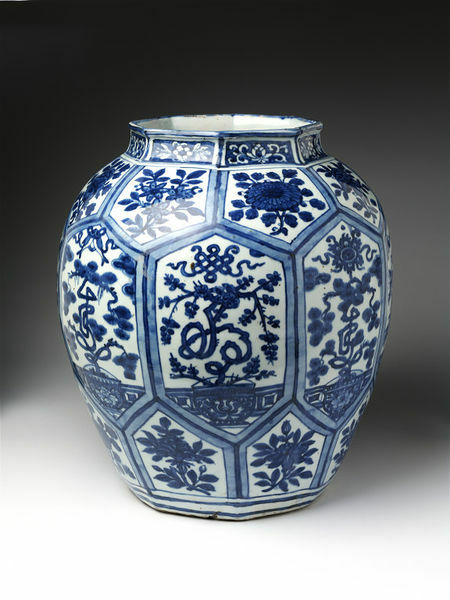 By 1350, Chinese blue-and-white porcelain was being made specifically for the Middle Eastern market. After 1500, the trade in such pottery was dominated by the Portuguese. A Portuguese ship probably took this jar to Iran, where it was purchased by the V&A in 1876.